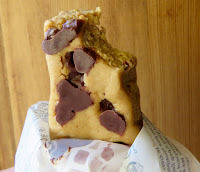 Today's Dark Chocolate Chip Peanut Butter bar from Perfect Bar (San Diego, CA) was the kind of protein bar you'd love to make yourself if you could. 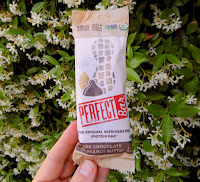 The company's refrigerated, honey-sweetened bars are satisfying and a bit addicting. The also taste better than 90% of the energy and protein bars on the market. This was a great mid-day snack. And it was filling enough to serve as a meal replacement. Not coincidentally, the Perfect Bar(s) are high in protein (15 grams), and higher in fat than many, but also contain a generous amount of powdered fruits and vegetables. This bar was Certified Organic and Gluten Free, and was Kosher (Dairy). *The Perfect Bar line was created by a family. Their father, Bud Keith, was a health food pioneer.